Lantham, MD: Roman & Littlefield. College student retention continues to be a vexing issue for colleges and universities. There are some very simple steps that a college or university can take to help students persist until they reach academic and/or personal goal attainment. This book is intended to give the reader the necessary tools, for all types of educational institutions and delivery systems, to implement a retention formula and success model that will actually help students meet their academic and personal goals and thus increase college retention and graduation rates. Regardless of the academic ability, socioeconomic status, gender, first generation, ethnicity of students, the retention formula and model presented will help each and every college type increase student retention and graduation rates. If you accept a student to your college or university you have an obligation (moral/fiduciary), in my opinion, to provide programs and services to help the student obtain her/his academic and/or personal goals. Otherwise why accept the student in the first place? Philosophy does not have to follow finance! Retaining students over time will actually increase revenue. Putting money upfront will come back many times over and most importantly help students accomplish their academic and/or personal goals and your college will fulfill its mission. By increasing student success will enable our economy to grow and successful students will beget other students to enroll at your institution; a win, win situation, something we all strive for. After all, isn't that what education is all about; giving people the tools to do what they want to do and a blue print that s/he can use to obtain future education seamlessly. And always remember what Seidman says: "Don't make it harder than it really is"! 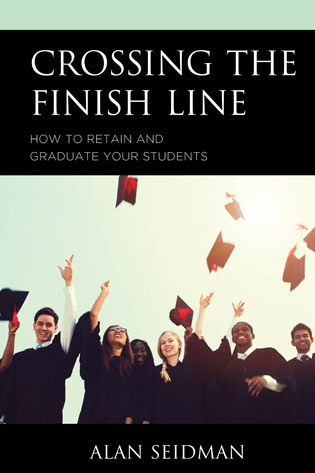 "In this short gem of a book, Alan Seidman presents a practical, comprehensive, and integrated process for successfully addressing student retention at the institutional level. It is highly recommended reading for administrators and policy makers at all institutions concerned with retaining students". "Among all of the topics studied in the field of higher education, retention of students remains one of the most perplexing. Countless numbers of initiatives and special programs including learning communities, boot camps, and co-requisite courses have aided some students but failed many. To shorten the path to graduation, colleges offer accelerated learning models and dole out generous dual enrollment credits while four-year graduation rates plummet. Colleges have even gone so far as to literally flip their classrooms and provide blended instruction while doggedly pursuing technology to intervene in solving the retention enigma; yet retention problems linger. In this unique book, Seidman trades research jargon for commonsense approaches aimed at practitioners'the people with the ability to affect change. I applaud Seidman's approach of providing "cases in point" to illustrate the most important aspects of this book. Everything is presented in understandable segments. I proudly support disseminating Seidman's student success formula and steps to success to promote crossing the finish line". © 2018 Seidman. All rights reserved.